At Hotel Sangam we believe in providing the hospitality & comfort that must create the feeling of being at home away from home. We have rooms with contemporary décor in pastel colors Dbl & Twin bedded , granite top bathrooms, work desk with telephone & amenities. The check in / Check out timings are 12 Noon. Hotel Sangam carefully designed with flexibility in mind, with unique air conditioned Conference Rooms, versatile rooms, and magnificent dining and entertaining facilities, The Hotel is extensively equipped to satisfy a wide range of Conference & Banqueting requirements. 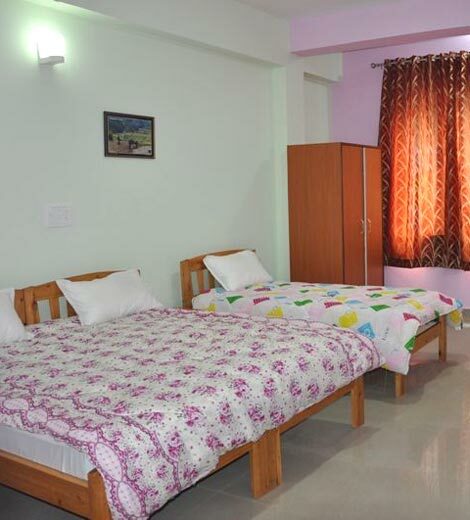 Hotel sangam has commissioned spacious well ventilated, well furnished rooms with, attached bathroom and running hot and cold water, Colour T.V and Telephone with direct dialing facilities. We offer board room A/C (40 Pax) and Party Hall (200 Pax) at very competitive rates.